Camo purchase for credits, only for rental? Just wondering now camo is at 50% discount. Is it not possible to purchase camo with credits (anymore)? When I go to the purchase section I can only purchase with gold, but why is there an option/indicator of buying it with credits? However that don't seem to be discounted though. Thank you, just what I thought. 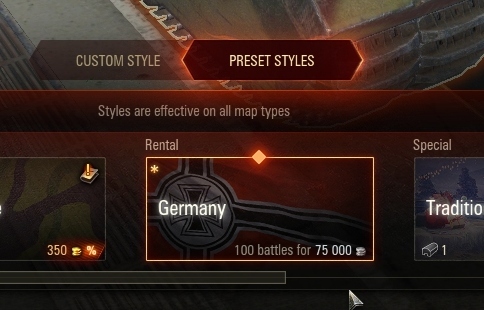 Only rental purchase for credits is possible, but the camo gets picked for you. Ah well, for the tanks I want to keep I purchase the camo for gold. WG have shot themselves in the foot financially with camo as far as I'm concerned. I've had a few great keeper tanks over the years that have been messed with and I've got rid of them. I wasn't impressed that the Gold I'd spent on permanent camo was essentially lost. On the other hand, rental camo still wasn't an option as I might not play some keepers for weeks or even months. Now that camo can be rented for 100 battles, screw the lack of choice, it's all I've had since the changes were brought in. The old credits camo went a long time ago. The new system is much better, it's battle limited rather than time limited and it can be moved from one tank to another so if you sell the tank before the camo runs out you can use it on another. And its far cheaper than the old system was because one payment gives you all seasons. That's what I like most, you can have the camo as long as you like, even though you haven't played the vehicle itself. Why bother buying camo. Once you have a set from each nation you can take it on and off whatever tank you are playing. Do you have any idea how much effort that is for some people like me who play a lot of tanks?